We chose the most original Mexican recipes and some easy recipes for Día de Muertos. We tell you how to prepare homemade Pan de Muerto and we also give you the recipe to make atole and thus be able to leave a more special offering. We gather easy and quick recipes so that you can prepare typical sweets and Mexican stews that are put in the offerings in Day of the Dead. Discover these easy recipes of Pan de Muerto Traditional, choose the option that you like best to prepare in the following celebrations. These homemade Atole recipes are the perfect accompaniment to the Pan de Muerto. Change the everyday and choose original flavors such as Cookie Atole. How to put aside the traditional Tamales? Prepare these Mexican recipes with unimaginable fillings, such as Cajeta Tamales. Did you know that mole is a special dish for celebrations? For example, funerals, that is why this recipe, like Mole Poblano, can not be absent. Accompanied by typical dishes or exotic combinations that include fruits, vegetables, dairy or meat, so is the tamale. We eat it every year, but where did this tradition come from? The bread of the dead is one of the reasons why we look forward to November. 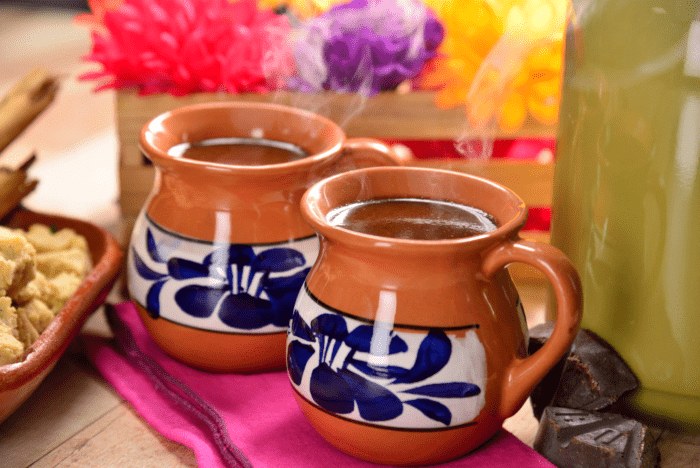 We leave you a list of recipes for hot Mexican drinks that you can prepare at home. Are you looking for recipes of Arroces Mexicanos? Learn different ways to make rice with the best recipes. Here the best sopes recipes. From sopes with chicken, chorizo ​​soup with potatoes to varieties of sauces. Learn how to prepare sopes on any occasion. Prepare the best typical Mexican stews, you will be surprised by the amount of recipes you can prepare, from a delicious cochinita pibil to a chicken with mole. Find the richest mole recipes with detailed descriptions of how to prepare the mole step by step. Try the rich mole poblano or the recipe for mole colorado, mole de pistache, and other Mexican mole recipes. Prepare delicious homemade Mexican sweets such as tamarinds, dulce de piloncillo, ate, muéganos, mostachones and more handmade delicacies that you can not miss. Become super ingenious this October 31st. These recipes will be very helpful if you want to organize a themed party and be the sensation in Halloween. Select each of the videos to not miss any step. If you're trying to eat original tamales, you have to prepare this recipe for Tamal Cake with Bean Sauce, which will undoubtedly be a success at your next meeting or party. This tamale made in an oven dish, and is stuffed with pork, plus it is very easy to prepare. A great tip of how to prepare a tamal is that you cover it with aluminum to conserve heat, and that the cooking is faster. For dessert fanatics crazy about corn, we have this recipe for Jacobs Corn Bread that contains the perfect touch: coffee! < Best of all, this fluffy cake will be golden brown on top to give it a better flavor, just be careful not to let overcool. This curtain of skulls is perfect to decorate your house this Day of the Dead. It is very simple to make and it will be the perfect touch for this incredible celebration. Prepare this Mexican Catrina strawberry and coconut gelatin at home. It is very easy to do and looks spectacular. You can not miss in your Day of the Dead party the representation of this famous icon of Mexican culture and what better way to keep it in mind than with a delicious dessert. In addition, for you to stay perfectly this elegant and folkloric skull do not forget to download the template with which you can finish decorating this original catrina gelatin. This simple and beautiful mask is perfect for any holiday with a Day of the Dead theme.